When I was a lad, television was a rarity. Very few houses had one. We weren’t allowed one in the house until I finished school because it would have been a distraction. 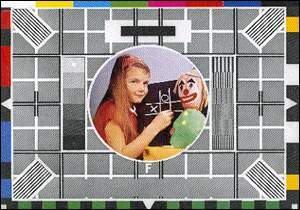 In those days there was really only two channels anyway – BBC and ITV. Then along came RTE and BBC2. And over the years they were joined by Channel 4 and RTE2. So for a long time we had six channels, if we were lucky enough to get the reception. Or two if we weren’t. Of course TV3 made an appearence at one stage, but it is exclusively devoted to showing the worst of ITV, and its presenters are pathetic. Then along came cable and satellite. I have the latter. A nasty little dish on the side of the house that gets blown down whenever there’s a gale. I haven’t done a count lately, but the last time I did, I had access to around 450 channels. And all of them are showing rubbish. Nearly every night it’s the same thing – flicking through the menus looking for something that is watchable. All we have are repeats, bad films [most of which we have watched in the past out of boredom], God channels, wine channels, shopping channels, paint-drying channels [that’s what we call those DIY type doing-up-a-house programs – they are about that exciting to watch], American comedies, “The Worlds Most Amazing whatever” channels and general tat. Now I don’t mind most of the satellite channels. They are cheap and nasty and are only good for the rare repeat of something good like “Open All Hours” or something. But I expect more from the Big Six – RTE BBC and ITV. RTE1 – Film “Catch Me If You Can”. I’ve seen it before. RTE2 – Film “The Edge”. I’ve seen it before. TV3 [God help us] – Soapstar Superstar – One of those ghastly programs where people make idiots of themselves for our amusement. BBC1 – Just the Two of Us – One of those ghastly programs where people make idiots of themselves for our amusement. UTV – Soapstar Superstar – One of those ghastly programs where people make idiots of themselves for our amusement. Channel 4 – Big Brother – One of those ghastly programs where people make idiots of themselves for our amusement. BBC2 – the only channel that was showing anything original, but I wasn’t interested. Now do you notice a pattern above? What is it about these awful programs where fifth rate celebrities or [even worse] members of the public queue up to make prats of themselves night after night? They are mind numbingly boring. And they go on and on and on. We are supposed to fall in love with our favourite person or couple and phone in and vote for them. I wouldn’t waste my time even looking for the phone, let alone making a call. I hate them. I would rather have my eyes pierced with red hot needles. Thank God for good books and sudoku.